New England Ski Museum will comply with requests for photographs and images from its collection as possible within the limits of staff time and image ownership. The Museum cannot supply images for which known copyright restrictions exist, but because information on certain images in the collection may be unknown, all responsibility for questions of copyright are assumed by the user. Permission is granted for one-time use only. Subsequent use requires permission of the Museum and payment of additional fees. 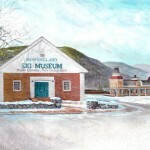 Credit must be given to New England Ski Museum, and to the creator if known. The Museum requests a sample copy of the work. Use fees apply. Orders will be prepaid by credit card unless previous credit arrangements exist. Image use fees for Museum members in good standing are waived up to a total of $60, and discounted 50% for amounts over $60. Most images in digital form are in .tif format at 300 dpi or higher.